About 1 year ago, I had a minor accident in Nazaré during a haulout. The stern pulpit and stern boarding ladder got an ugly bruising. I straightened the pulpit as best as I could using the main halyard and winch, brute force, etc. 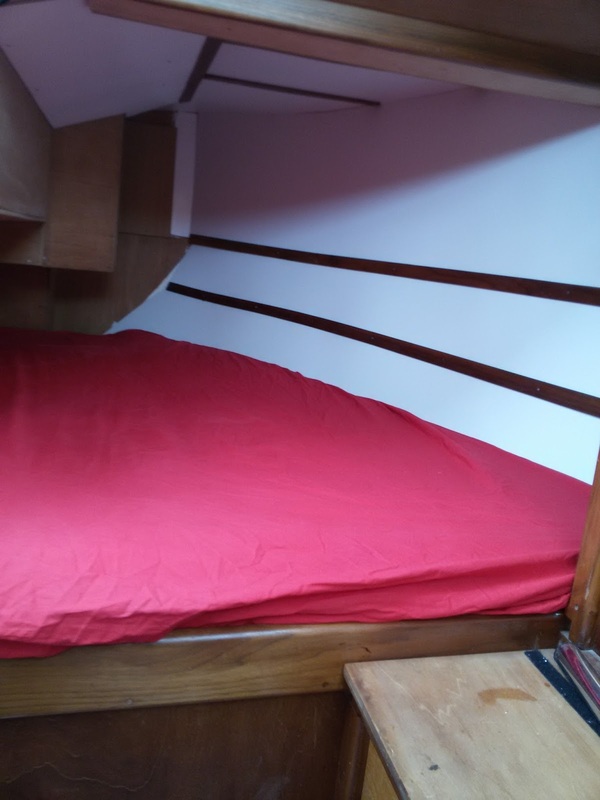 I spent nearly a year idealising the perfect boarding ladder setup. I took pictures of other boats, I Googled it, I fell asleep think about it. A while back, I took the detailed schematic drawing to a local metal shop. The owner's son, who was also raised in Canada, looked at my drawing for about 1 minute and asked, "why don't we do this instead?" Which is what you see below - PERFECT!! (38 euros). The guy, Emanuel, is a genius, I tell you...at least compared to me. 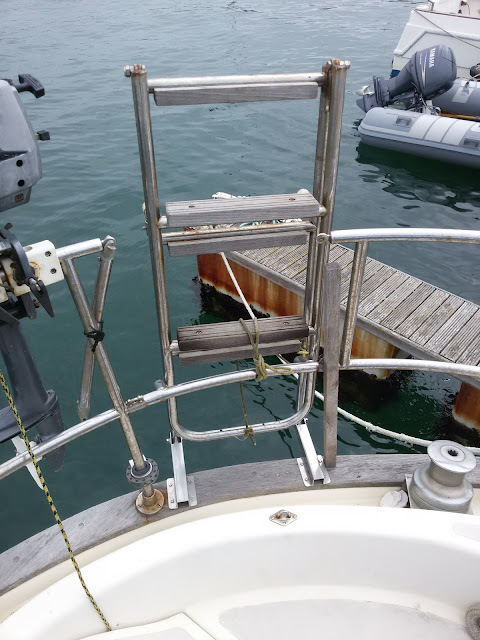 The ladder now folds up, and then swivels onto the railing, instead of hanging off the transom like a dilapidated eyesore. Steady as a rock too. This is the quarter berth after removing most of the cheap rotting decorative plywood. And this is the new look. 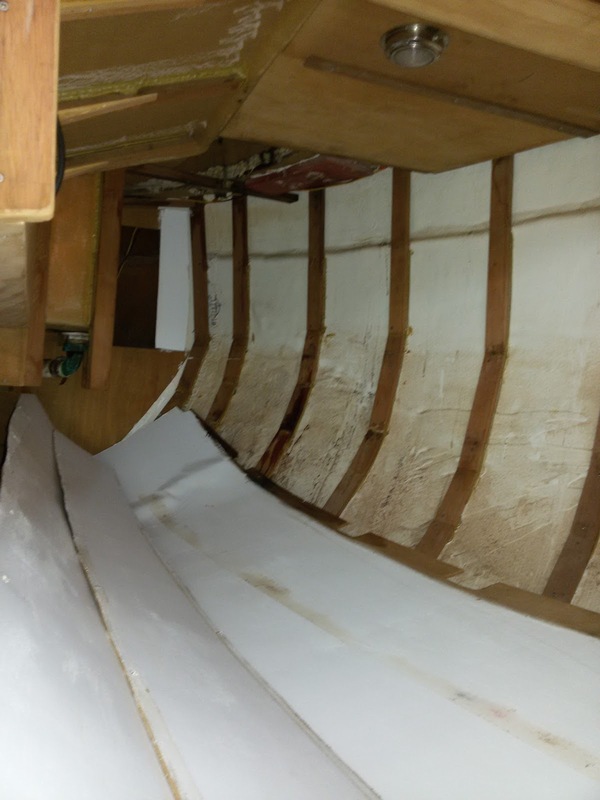 Komacel for boat interior work is the way to go. I still need to finish the trim, paint some of the wood and varnish some pieces. 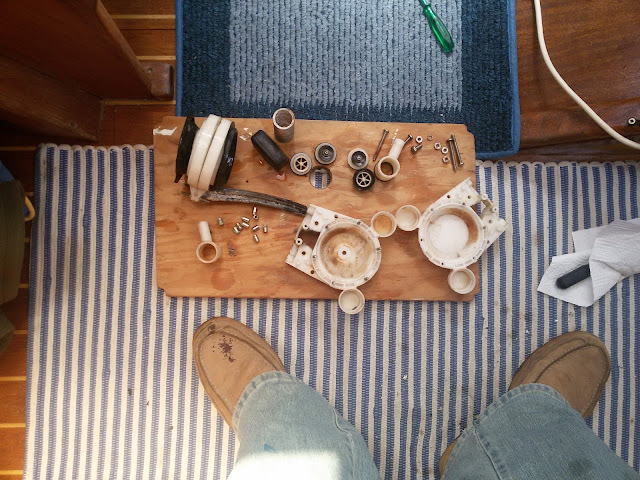 And this is my old water foot pump, that failed and which I totally destroyed in an attempt to fix it. It worked flawlessly for 16 years, so can't complain, I suppose. Here's the replacement pump which I ordered on Ebay from Greece - of all places (€67). 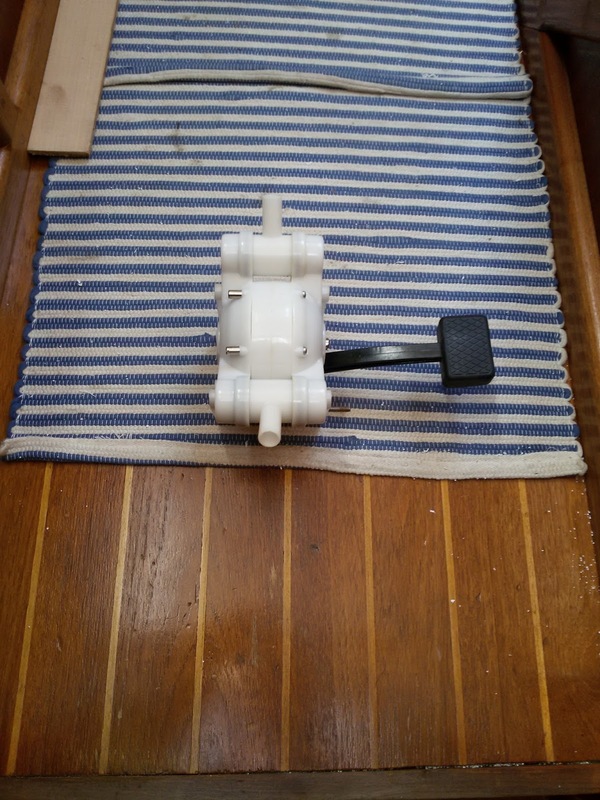 I could have bought a Whale gusher pump for a few more euros, but this is the exact same TMC pump model as the old one (built in Taiwan), and it was an easy install without needing to drill more holes. A sliver of wood somehow got into the water tank and perforated one of the old pump's diaphragms. 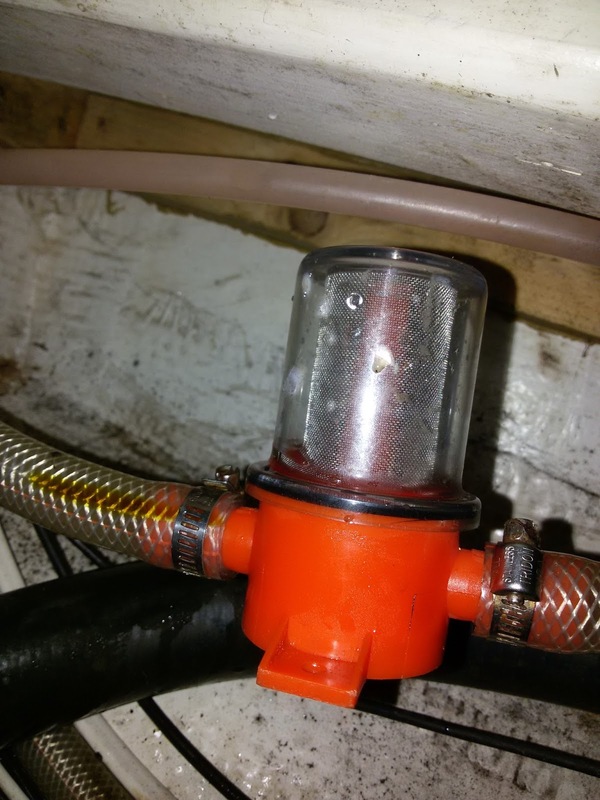 To prevent any other foreign objects from killing the new pump, I installed a filter in the intake hose. Not being stupid twice is almost as good as being genuinely intelligent. 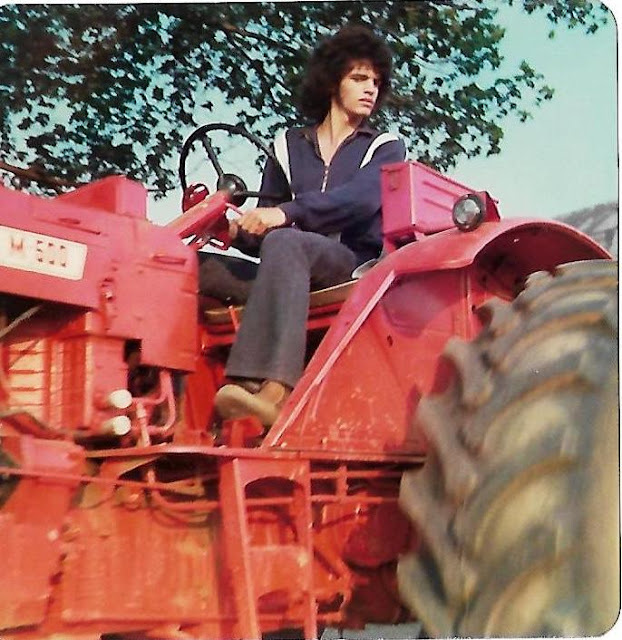 And now, for the last "Before and After" picture, this is me back in Canada living on the farm operating a Belarus tractor, one of our Russian tractors. This is me now on a BAD DAY, working on the boat wondering where all the fun - and hair - went. That tractor shot is priceless! ! So is the after shot! So that ladder.... you must have used parts from the old one cause that's way too cheep! Looks great. Good move on the filter before the pump. You'll be amazed what it'll catch. Just keep an eye out for when it fills. And I need that GR ebay site. Hopefully it's not from the Lalizas chandlery. .. all they have is cheep "oriental" stuff which only last a season or two. As for the berth..... I'll be over tomorrow for a siesta...I'm sooo tired! I like the tractor shot better! It's the same ladder, he straightened it and added the shiny swivelling feet. The Greek ebay site is http://www.ebay.com/usr/y9bn?_trksid=p2047675.l2559, if that doesn't work the seller is called y9bn. The pump was only about 42 euros, its the shipping that hurt. Should be cheaper shipping to you, maybe he lives next door and he has lots of other stuff! 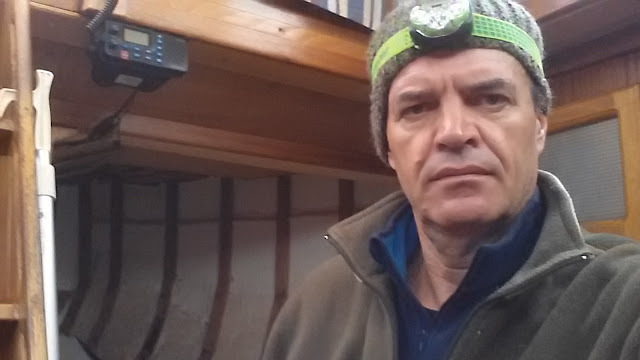 Forget about the siesta, tomorrow is the annual regatta and the boat is dirty as hell and I've got a huge translation. So if you come over you're gonna be cleaning and racing!!! On the other hand, maybe you're tired of being on holiday :-).